She might be hard to read at first because she is unsure of you, but bear with her. There are days she might blow up your phone and days she might not reply to your texts. There are days she will want to be cradled in your arms and days she doesn’t want you to touch her. There are highs and lows, there are mixed signals and there are endless worries running through her mind because she’s the girl who’s used to being on her own. She wants to allow herself to commit and open up to you, but part of her questions whether or not you will leave. She is used to being on her own so the last thing she wants is to allow herself to open up, to become comfortable and vulnerable to have you walk away. She knows what it feels like to have someone walk out on her, she knows what it feels like to have someone turn their back when things get hard, she knows what leaving feels like because she’s felt it one too many times. Loving the girl who’s always single can be a challenge at first, she’s built her walls up because they’ve become here home and her comfort. She hasn’t built a home out of anyone but herself because she’s learned that the only person who will always be there for her is her. She’s spent a lot of time investing in herself, investing in creating her own happiness and investing in her own hobbies that allowing you into her life is scary. It’s scary because for so long she’s been used to doing things on her own. When she has an itch on her back she’s the one to scratch it. When she needs something from the top of the shelf she’s the one who stands on a chair to get it. She’s mastered living on her own for herself, but you coming into her life would completely flip her world and that’s scary. She’s probably thought about love for a while, but the idea always seemed so far out of reach. She probably thought that love wasn’t in her deck of cards, but then you came along and it’s scaring the hell out of her. Because as much as she wants you in her life, the only thing that scares her more than you leaving is you staying.She can handle leaving, she’s mastered the art of picking herself back up and moving on, but she doesn’t know what she’d do if you actually stayed. She’s become so comfortable on her own that the thought of you scratching her back or the thought of you reaching for the top shelf makes her a little uneasy because as much as she mastered it on her own, once you come in and start doing those things for her she won’t want you to stop. After she becomes comfortable with you in her life she won’t want you to leave and that’s the hardest thing for her to grasp. The girl who’s always single knows how to be single and she knows how to deal with getting back up on her own, but she doesn’t know how to deal with you staying. 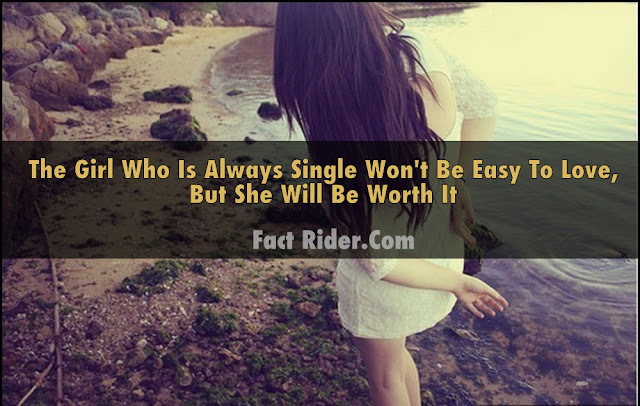 Bear with her because the girl who is always single will love the hell out of you, but it just might take her a little more time to get comfortable with you. She will love the way you’re so tall you don’t need a stool to stand on, she will love how you scratch her back, she will love making you morning coffee, she will love you giving her a hand in the kitchen, she will love you sleeping by her side. She will love every second she has with you because once the perpetually single girl gets comfortable with you, she will open her heart to you and let you in, so please don’t abuse that. Falling for someone she gave her heart to and having him leave after she opened up would destroy her, so please be kind. She might not be easy to love at first, but I can promise you she will be worth it once you peel back the walls she’s built around her and you prove you’re in this for the long haul. She will make it all worth it.